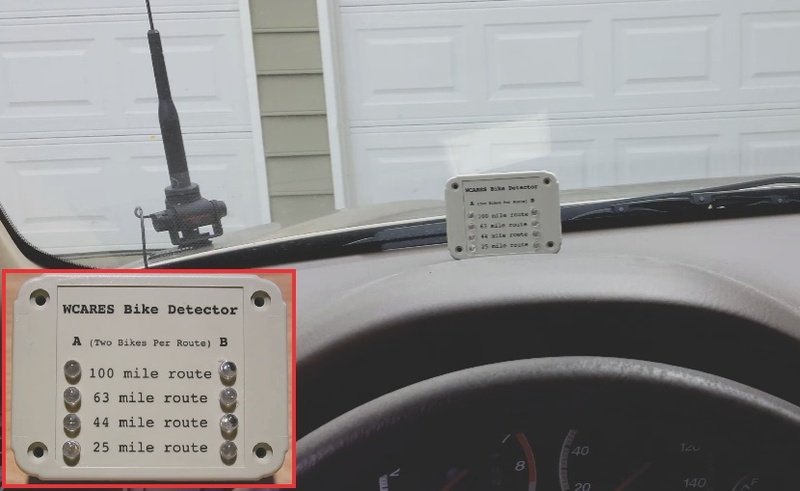 Cliff Batson (N4CCB) has put together a network of cycling event sweeper detectors. In a biking event the “sweepers” are the last bikers who ensure nobody in the race gets left behind. Each of the 4 routes of the HRR cycling event has 2 sweepers. They are equipped with a Moteino transmitter running on 9V battery power that keeps them going all day for the event, while transmitting a beacon every 4s. They beacon their identity to the various checkpoints/rest points and in sag vehicles (cars with “bike detector” receiver units) to keep track of which bikes are near by. According to Cliff the range of the Moteinos is very impressive, even when crammed into a pill bottle alongside a 9 volt battery. When the last 2 sweeper bikes came through the his Rest Stop at the end of the day, he got notified of the arrival of the first bike and then, about 30 seconds later, was notified of the second bike’s arrival. He then left the Rest Stop area and walked toward the street and he couldn’t even see the 2nd sweeper bike for the 100 mile route. But, about 10 seconds later, it came into view, quite amazing and something you may never achieve with 2.4ghz. Nice little project, check out the video linked above for more details and demo.